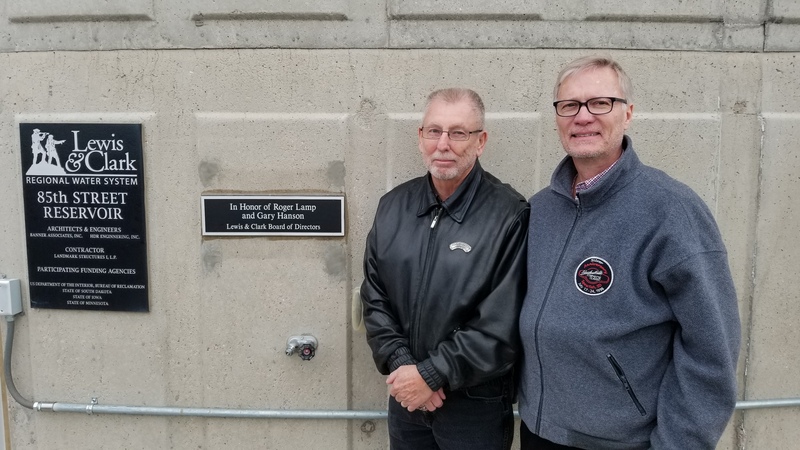 On October 4 Lewis & Clark’s three-million gallon 85th Street water tower in southern Sioux Falls, which is a joint connection point for Sioux Falls and Lincoln County RWS, was dedicated in honor of Gary Hanson (right) and Roger Lamp. 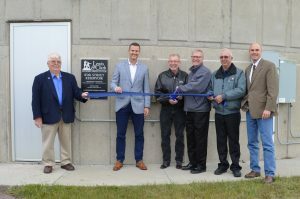 Hanson of Sioux Falls was a key leader in getting the project off the ground in the late 80’s and then served with great distinction as Lewis & Clark’s first chairman for close to five years from January 1990 until November 1994. He made numerous trips to Washington, D.C. and testified at various hearings in an effort to secure congressional authorization. Lamp of Lincoln County RWS served on the Lewis & Clark Board of Directors with great dedication for 25 years, retiring in April 2017. He served on multiple committees, including the Construction Committee and as Treasurer on the Executive Committee. 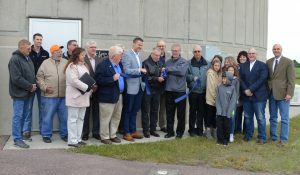 “It is truly a pleasure for us to dedicate this water tower to these two outstanding individuals. We cannot thank them enough for their hard work and leadership in helping bring Lewis & Clark to where it is today,” said Chairman Red Arndt.